Jennifer Robson is the USA Today and #1 Toronto Globe & Mail bestselling author of Somewhere in France and After the War is Over. She holds a doctorate from Saint Antony’s College, University of Oxford. She lives in Toronto with her husband and young children. we so drawn to the City of Lights? And what is it about Paris in the 1920s that we find so particularly fascinating? 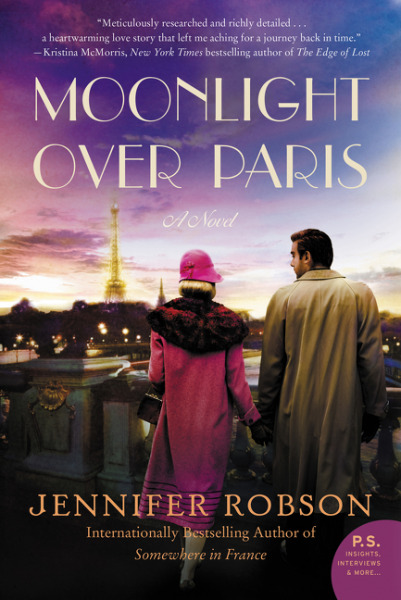 Did you enjoy encountering real-life figures in the pages of Moonlight Over Paris? Is it possible to portray such iconic figures as F. Scott Fitzgerald and Ernest Hemingway with any degree of accuracy? Or has their fame obscured the real men behind the legends? This novel is set six years after the end of World War I, but even still the characters and Paris itself are affected by those years. How do we see this with our characters? What do we see of this in the city itself ? Would a year in Paris, with all the freedom that Helena enjoys, have been possible for most women in that era? Or was it the case that her family’s wealth and status made it more easily achievable for her? If you were able to read the story of one of the other fictional characters in the book, whose would it be? Étienne’s? Aunt Agnes’s? Another of the secondary figures? Music, visual art, and the written word play a big role in this story. Why do you think that Paris became such an epicenter for artistic expression during this time? Do you think the aftermath of the war played any part in this? How does the character of Helena change and evolve over the course of the novel? Do you think Helena ends up fulfilling the promise she makes to herself at the beginning of the book?